Not long after Mike Cameron hinted at retirement, the Marlins gave him his walking papers, letting him begin his post-baseball life a few weeks early. At 38-years-old, this is probably the end of the line for Cameron, who has spent most of his career as one of the game’s most consistently underrated players. It’s time he got his due. He’s not going to make the Hall Of Fame. He probably won’t even get more than a handful of votes, and he’ll be off the ballot after his first year of eligibility. But if there was a Hall Of Very Good, Cameron would a charter member. While he’s probably not going to remembered as fondly, he was basically this generation’s Devon White. Yes, he’s a career .249/.338/.444 hitter, and those numbers simply don’t stand out as anything that need to be celebrated, especially in the context of the offense-infused era in which he played most of his career. But, like White, Cameron didn’t derive most of his value at the plate, but instead in the field, where he was one of the best defensive outfielders of his time. You don’t have to buy into defensive metrics (which, incidentally, rate only Andruw Jones and Darin Erstad ahead of him among center fielders from 1995-2011) to understand just how good Cameron was defensively. He’s the kind of guy whose skills in the field were obvious to anyone who watched him play, with enough range to cover gaps to both sides and jumps that allowed him to run down nearly anything hit to center field. He anchored the 2001 Mariners outfield – perhaps the best defensive team in recent history – and was the driving force in the team holding opponents to a ridiculous .260 BABIP on the season. In fact, if you look at Cameron’s trek through the Major Leagues, you see a consistent pattern of his arrival coinciding with the career rebirth of some mediocre starting pitcher who magically posted a low BABIP out of nowhere. But, Cameron wasn’t just the center field version of Omar Vizquel. Despite being a superlative defender, he was also a good hitter, and is perhaps the best example on earth of why you need to pay attention to park effects when judging a player’s abilities. Cameron’s career .344 wOBA is more than respectable for an up-the-middle player, but it’s actually even more impressive than it sounds – 31.3% of his career plate appearances came in Safeco Field, Petco Park, or Shea Stadium. Petco is the worst place on the planet for hitters, and Safeco isn’t far behind when it comes to right-handed pull power guys. Shea was also a notorious pitcher’s park, and since he spent a large portion of his career playing half his games in those three parks, it shouldn’t surprise us that Cameron’s career road OPS (.804) was significantly better than his mark at home (.758), despite the fact that most players perform better with home cooking over larger samples. That’s why we have metrics like wRC+, which not only adjust for park effects, but also align the numbers to the league averages of the time period. During Cameron’s time as a starter, he posted a wRC+ of 110, meaning that his offense was 10 percent better than a league average hitter. Not a league average center fielder. Not a league average player with good defense. Just a straight up, normal, league average hitter. Cameron was 10 percent better than that, just at the plate. For comparison, he has a better career wRC+ than Johnny Damon (108) or Torii Hunter (107), and he’s not that far off the marks put up by Andruw Jones (112), Kenny Lofton (114), or Robin Yount (115). This is pretty good company, and we’re only discussing the offensive performance of a guy whose bat was his second best asset. 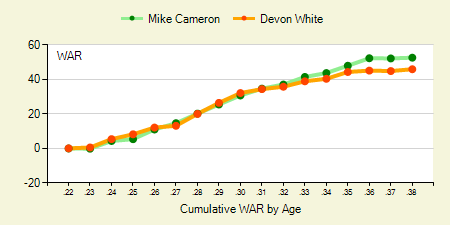 From 1997 to 2009, Cameron ranked 18th in baseball in Wins Above Replacement. Not among outfielders, but among all players. During the 12 years he was basically an everyday player, he created essentially the same amount of value as the likes of Lance Berkman, Jeff Kent, and Jim Thome. He didn’t have any crazy great peak seasons that put him on the map, and his career wasn’t long enough to justify Hall of Fame enshrinement, but when Mike Cameron was on the field, he was consistently one of the best players in baseball. We hoped you liked reading Giving Mike Cameron His Due by Dave Cameron! How Much Did Carpenter Leave on the Table? I seem to recall popular sentiment at the time was that the Reds didn’t really give up all that much to acquire Ken Griffey Junior but it would appear they would have been better off just keeping Cam Boogie.